Mary is staying with her Great Aunt Charlotte while waiting for her parents to return home and her school holidays to end. When she finds a strange blue flower in the woods, she finds herself whisked away on an adventure to a magical academy for witches and warlocks hidden among the clouds. Wonder turns to desperation as the school’s teachers are revealed to be more than they seem – and the race is on to prevent them using magic for catastrophic purposes. When Hayao Miyazaki completed his last animated feature The Wind Rises and announced the latest of several retirements, a group of animators at his Studio Ghibli split off and formed their own production company. Mary and the Witch’s Flower is the debut feature from Studio Ponoc. It is directed by Hiromasa Yonebayashi, who worked on multiple Ghibli productions including Princess Mononoke and Spirited Away as well as directing Arrietty and When Marnie Was There. 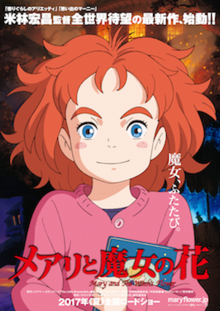 Boasting a near-identical aesthetic to Miyazaki’s own works, Mary and the Witch’s Flower would essentially seem to be a Ghibli production in all but name. To an extent that is part of the film’s downfall. The story is adapted from Mary Stewart’s childrens novel The Little Broomstick, but a bigger inspiration would appear to be Studio Ghibli’s own back catalogue. A mish-mash of story elements remind the viewer of other, and significantly better, animated films. Mary rides a broomstick and one thinks of Kiki’s Delivery Service. She arrives at a city in the clouds and one thinks of Laputa: Castle in the Sky. Yet more characters and moments draw on Spirited Away, My Neighbor Totoro, and Ponyo. It interferes with viewer engagement, since if all one does is be reminded of other films then there is little chance of fully engaging with the one currently playing. The film is particularly cursed by a poor story structure. It takes an inordinate amount of time for the story to get going, yet the simplistic and superficial introductions of the characters makes engagement difficult. For about an hour the film is a genuine chore to sit through, burning up pretty much all goodwill before events grow interesting. When the film does pick up, it has rather a lot to recommend: some nice character moments, a great aerial chase, and an explosive climax. The pace, however, remains uneven. Scenes that could benefit from more gravitas and length feel unfairly truncated, while short action beats get over-extended. The animation is superb, and while the design work hews too closely to the Ghibli source it remains charming to watch. Altogether it demonstrates great skill in art and animation, but it seems the crew didn’t pay enough attention to how Miyazaki builds a story – and that really is the key to why his films remain unparalleled in animated cinema. The English language dialogue suffers from a few poor choices in actor. Ruby Barnhill (The BFG) plays Mary in a constant state of high-pitched incredulity, something that Japanese performer Hana Sugisaki thankfully avoids. Ultimately it is up to the viewer whether they view the film in Japanese with subtitles or in English – there is no right or wrong way to watch anime – but it is worth noting that in this case in particular the Japanese dub is truly the superior version. Studio Ponoc demonstrates excellent technique in their debut, but for long-term creative success it is imperative that they develop a tighter story structure and a more individual aesthetic. More forgiving viewers may find much to enjoy in Mary and the Witch’s Flower, but more I suspect – myself included – will simply bemoan the lost opportunities.